I knew there are lots of accidents related to Crocs. But it still happened. Takara's right foot was stuck in between escalator and its side wall. We were coming down from the 7th floor of Gurney Plaza. Takara and Arata were talking about one of the cinema posters which looks like the Transformers. Takara tried to climb on the escalator wall to have a good look. I shouted, "Don't do that! You will fall." And in the next moment, he screamed, "My foot!". His right shoe was stuck! I pulled it and it came off, a part of the shoe was still stuck in the escalator, but I felt relieved. But Takara started to cry! Looking at his foot, I found it was badly bleeding. I tried to stop the bleeding with some tissue but one of the cut was quite deep. Quite a few Malaysians came to try to help us. I asked them if they know where the First Aid is. But there seems to be such facility there. 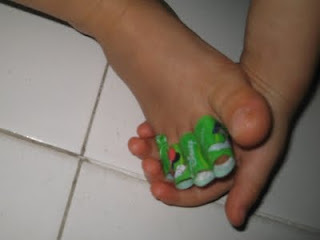 One of them brought us a couple of sticky plasters. He also offered to carry Takara to our car. When the man was carrying Takara, Takara he stopped crying. So I took him over saying thank you and came home. He had his 4 right toes cut. He looked shocked for a while but now he is playing ok. I couldn't really make up my mind if I should take him to hospital. Anyway it wasn't that bad although this happened while Jason is away. In Malaysia, Crocs shoes including fake ones are very popular. But I won't buy another pair for kids any more. 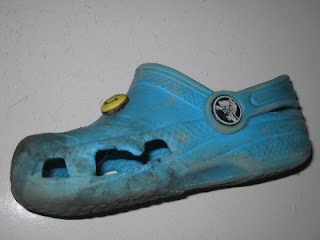 Arata's Crocs also torn a few weeks ago. Shoes don't usually tear! Flip flops are popular here as well but they also tend to cause the same accidents. Oh its terrible.. i never knw this..